Real gas sipper!!! 32 MPG Hwy... 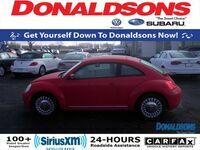 This is the perfect, do-it-all car that is guaranteed to amaze you with its versatility.. Volkswagen CERTIFIED*** CARFAX 1 owner and buyback guarantee. Very Low Mileage: LESS THAN 11k miles!! Classy!! Safety equipment includes: ABS, Traction control, Passenger Airbag, Daytime running lights, Signal mirrors - Turn signal in mirrors...Other features include: Bluetooth, Power locks, Power windows, Heated seats, Auto...Volkswagen Certified Pre-Owned means that you not only get the reassurance of a 2yr/24,000 mile Comprehensive warranty, but also a 112-point inspection/reconditioning, 24hr roadside assistance, and a complete CARFAX vehicle history report.